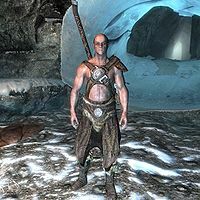 Thorgar is a Nord warrior, desperately trying to make a living in Whistling Mine. He owns the mine and still believes that they will strike something better than iron and become rich, even though the mine barely even has any iron. He will purchase any iron ore you happen to have, for seven gold a piece. He will sleep on one of the bedrolls in the mine from 8pm to 8am. While he is awake he will wander around the mine, cooking, mining from the few ore veins or sitting at the table. Thorgar wears hide armor with matching boots. He wields an iron battleaxe for defense and carries a variety of lower-class items and gold. His obsession with finding his fortune in the mine becomes apparent when speaking to him as he will say, "The mine will be the talk of Skyrim soon, you'll see. It'll be the stuff of legends." and will add, "I know they laughed when I said I wanted to keep the mine open. I'll show them. I'll show them all." He will also hint at his true intentions with "It's a matter of time before the Jarl is coming to me asking for money. This mine is going to make me... I mean us, rich." and provide a warning: "You're welcome to look around, of course, but understand that this place belongs to me." This page was last modified on 1 June 2014, at 16:21.